The Milpitas Neighborhood Watch Program joins the Milpitas Police Department and neighborhood residents in an effort to combat crime. You cannot expect to have a police officer on your street 24 hours a day. You must take the initiative and join together with your neighbors and the police department to regain control over your neighborhood. With your help, this can be done. It has happened in other neighborhoods and it can happen in yours! 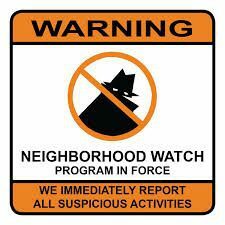 The Neighborhood Watch Program is monitored by the Police Community Relations Unit and regular meetings can be held in your neighborhood to discuss issues on home security, recognizing and reporting suspicious activity, personal safety, and problems specific to your own neighborhood. The Police Department offers a wide variety of services beyond responding to calls for service. The Neighborhood Watch newsletter is an excellent additional means of communication between the Police Department and you, the citizens. We encourage you to read the newsletter, and take advantage of valuable information offered. To start a Neighborhood Watch Program in your neighborhood or to schedule an update meeting, contact us at (408) 586-2400. To report Emergencies Dial 911 from any phone.